Olatokunbo Carew is a Director of ARCO Group Plc. He is an Engineer and seasoned administrator of resources. In 1983, he obtained a B.Sc. (Hons.) degree in Electronic/Electrical Engineering from the University of Ife (now Obafemi Awolowo University), Ile-Ife. 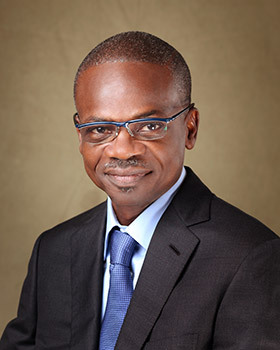 In furtherance of his studies, he obtained an MBA degree in 1987 from the University of Lagos, Akoka, with a bias for production management & operations research. Prior to joining ARCO in 1989, Mr. Carew held several senior executive positions in the public service, manufacturing and the Japanese International trading firm, Sumitomo Corporation. He has brought to bear on the strategic formulation framework of ARCO, his wealth of experiences gained from technical Operations, Business Development and Commercial Portfolios, combined with his ability to analyse complex issues and recommend viable courses of action. He has been a principal player (from conception, through tender to execution) on several large ticket projects which form the core experience profile of ARCO, making him one of the props that have kept the ARCO flag flying in the years past, despite the vagaries of the business environment. He has participated in several professional and executive training and development programmes in Nigeria and abroad, including the Senior Management Programme (SMP) at the International Institute for Management Development (IMD), Lausanne, Switzerland. Mr. Carew has in-depth knowledge of local & global developments in the oil and gas industries. He retired from ARCO in 2009 but has retained his seat on the Board. Mr. Carew is a member of several professional bodies including the “Nigerian Gas Association”, “American Institute of Electronic & Electrical Engineers” and the “Nigerian Institute of Management”.